Engulfed by deodars and the lake in the middle, Khajjiar due to its topographical resemblance is rightly called as mini Switzerland. You can best explore this place on foot and hence walk is the best way to get around. Khajjiar nestled in the small plateau, covered with weed, surrounded by thick forests and meadows with a small stream lake founds an amazingly terrific beauty at 2000 m above the sea level, giving the western Himalayan view. Khajjiar was marked the ‘mini Switzerland’ on a world tourism map on 7th of July, 1992 by Mr. Willy T. Blazer, the then Vice Counsellor and Head of Chancery of Switzerland in India. The counselor has taken a stone, to remind the visitors of Khajjiar from among the Swiss Parliament that it is the mini Switzerland of India. The best places that you can visit without starving in this mini land of Swiss are the villages of Khajjiar- Rota, Ladi etc. where one gets familiar with the culture of the tribes, their homes, lifestyle, food etc. 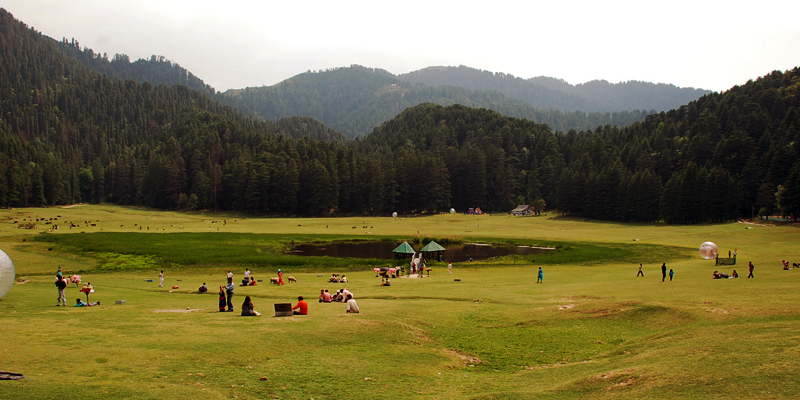 Khajjiar with its vast green meadows seems so beautiful in its own vast way posing a different view in each season. Khajjiar valley is the vast plain land with dense forest line in the surroundings. There is a small lake in between the land with a little wooden walkway to the colorful lake. Taking a galloping horse ride here is one of the best experiences exploring different types of trees and the combination of nature. There is also a golf course in the region surrounded by the pine trees. The 12th-century Khajjinag temple famous for its intricate wooden carvings and its history and Golden Devi temple at the end of Khajjiar Lake is some of the holiest temples of the region. The other major attraction is the panch Pandav tree famous for its shoots, the locals believe that the 5 shoots are the 5 Pandavas and the 6th shoot is Draupadi. Khajjiar is also famous for Kalatop wildlife sanctuary with oak and coniferous trees, 19.63sq km widespread famous for deer, leopard, black bears, wild cats, Himalayan black marten and many endangered species.